I have seriously been rolling this idea around in my head for close to a year. 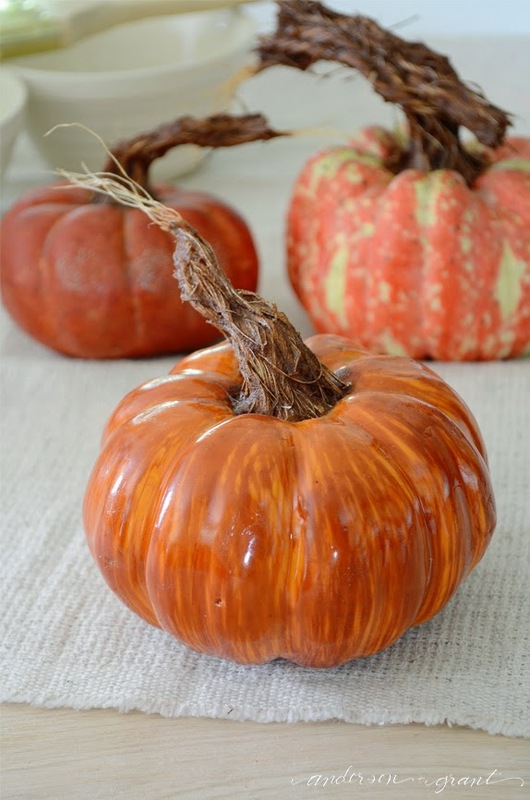 Last fall, I picked up a cart load of pumpkins from Hobby Lobby for 90% off the day after Thanksgiving. I wasn't sure exactly what I was going to do to the pumpkins, but I knew that I wanted a bunch of them in a variety of shapes and sizes....and who can walk away from 90% off? Believe me, I had to fight off many other people who were also interested in a cart load of fall merchandise! 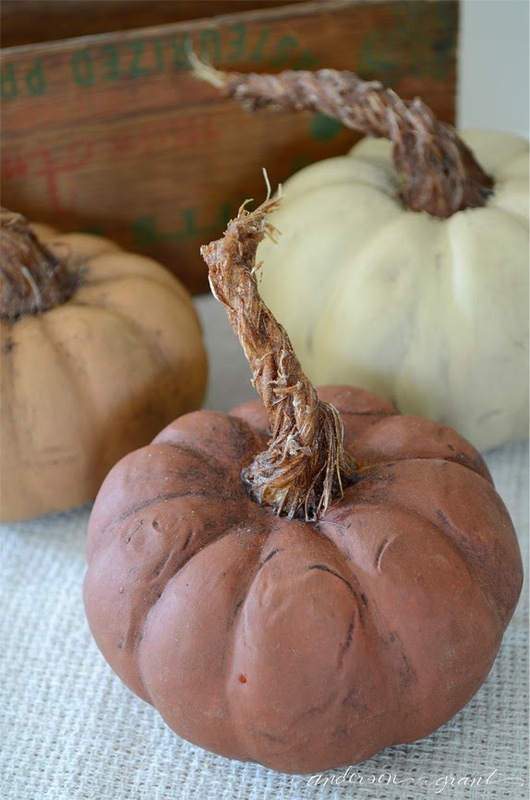 I started with a collection of different pumpkins.....different sizes and shapes. I even had a couple big pumpkins in addition to these small ones. 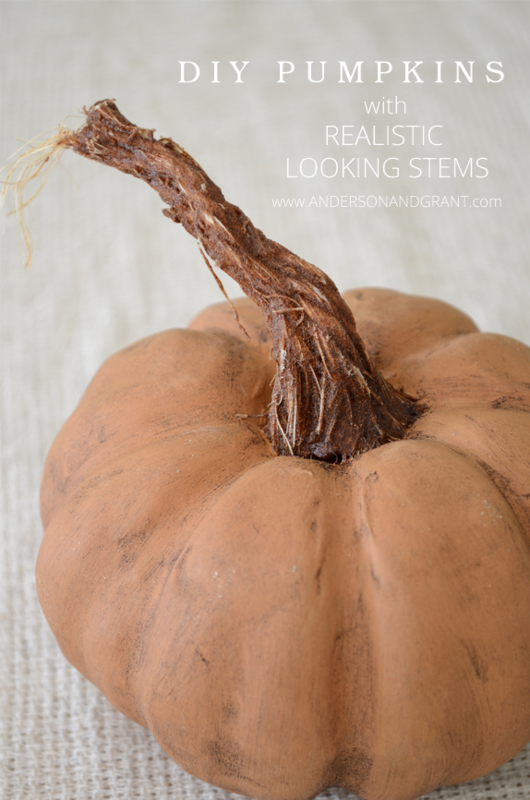 Pumpkins are not naturally perfect and smooth, so before beginning the process of making your stems, you'll want to "distress" your pumpkin a bit. The pumpkins I used were made over a styrofoam base, so all I needed to do was press, punch, and poke various areas on the pumpkin to make them look a little imperfect. 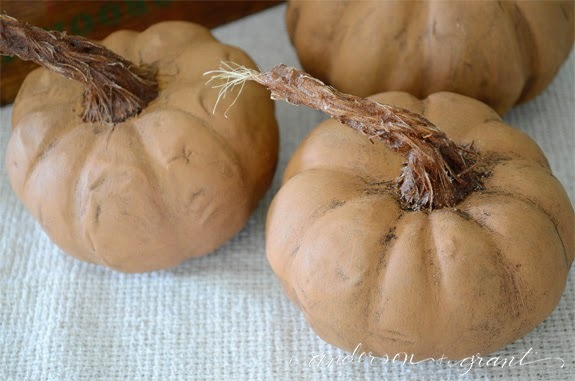 The distressing will really become more noticeable after the pumpkins are painted and antiqued. To make the stem all you need to have is sisal rope, hot glue, cinnamon, and Mod Podge. Cut some small strips of the sisal. 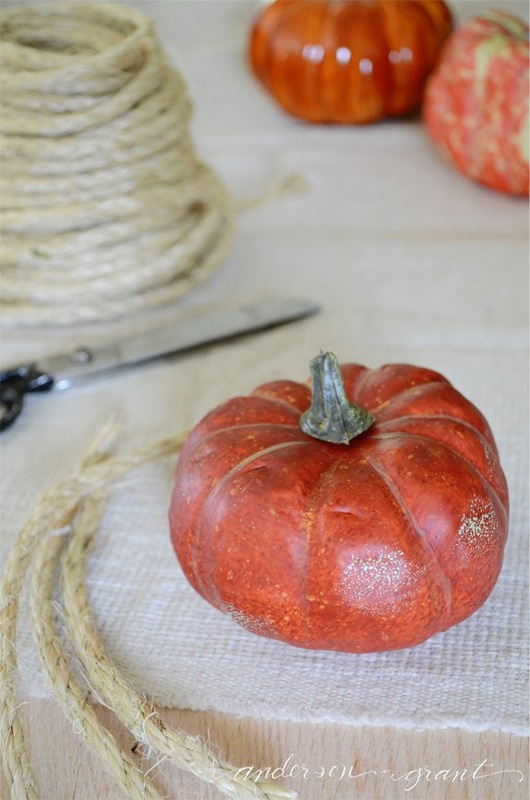 Separate the twisted rope into individual pieces or twists of two or three coils. 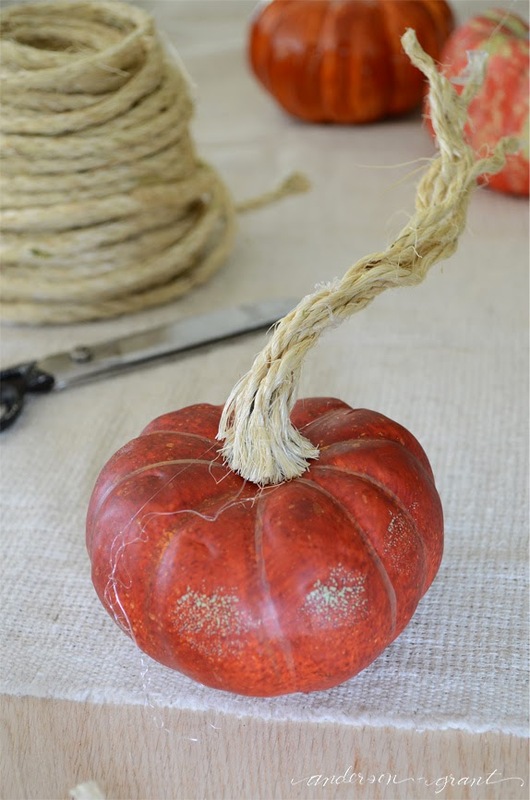 Fray the ends and attach them onto the stem of the pumpkin with your hot glue gun. Continue around the entire stem gluing the strips of sisal. I know it looks a little strange, but don't judge quite yet! To form the stem, add a little glue into the center of the strips of sisal, attaching everything together. You don't need to glue the entire strip, but just every so often to secure the pieces. 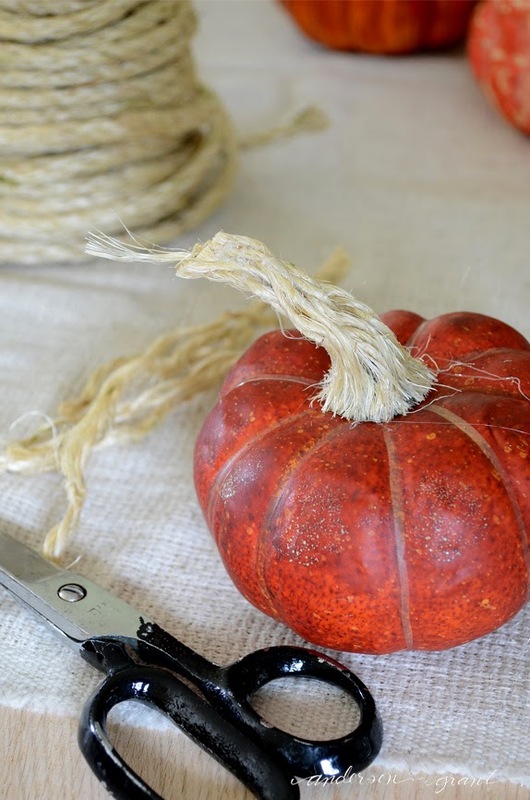 If you want the stem to bend or twist, just add a little more glue to fold the stem over. Cut your stem off at the length you desire. 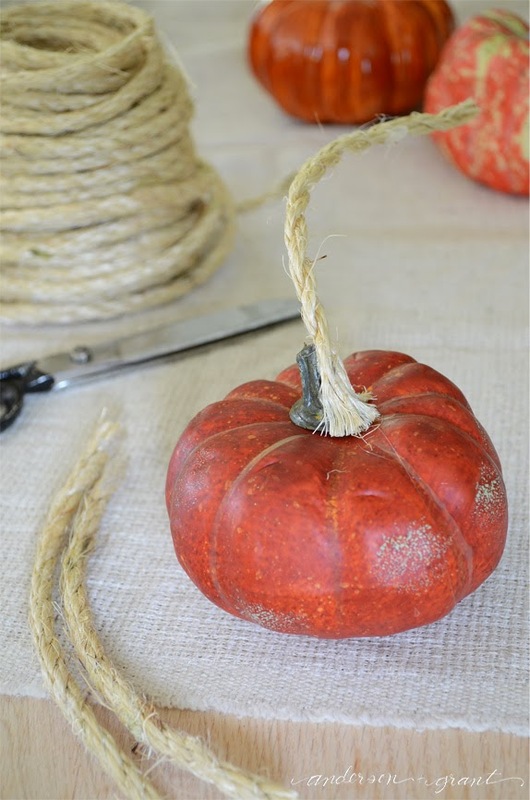 To make the stem look a little more real, I left a few strands of the sisal longer than the stem like it was just ripped out of the pumpkin patch. 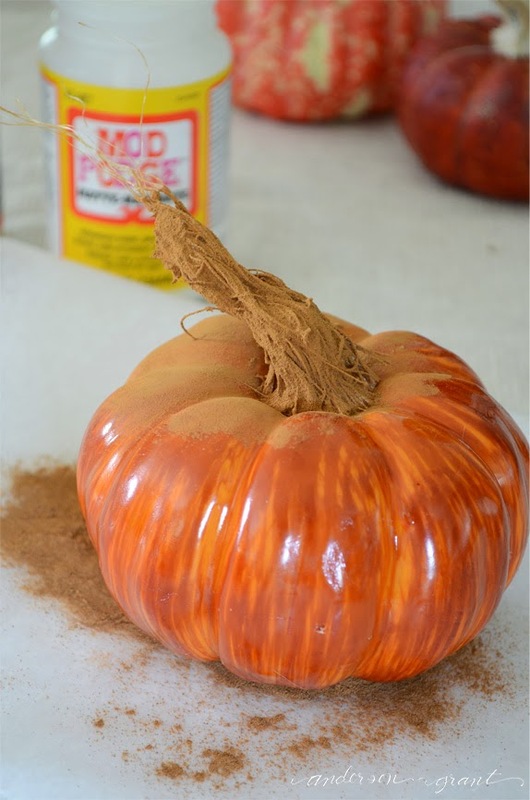 Coat the entire stem with Mod Podge, then cover it in cinnamon just as though you were glittering something. You don't need good cinnamon.....the version sold at the dollar store is perfect. Allow the Mod Podge to dry. 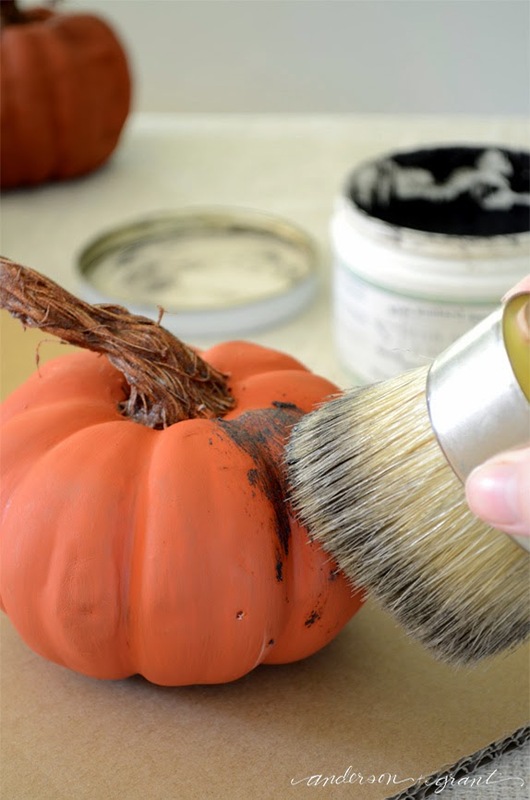 After the Mod Podge has dried, brush the excess cinnamon off of the stem and pumpkin. Then coat the entire stem again with Mod Podge. Do not cover it in cinnamon this time. Everything will become hard. Some of the cinnamon may get brushed off, but that is okay. Allow the stem to dry again. 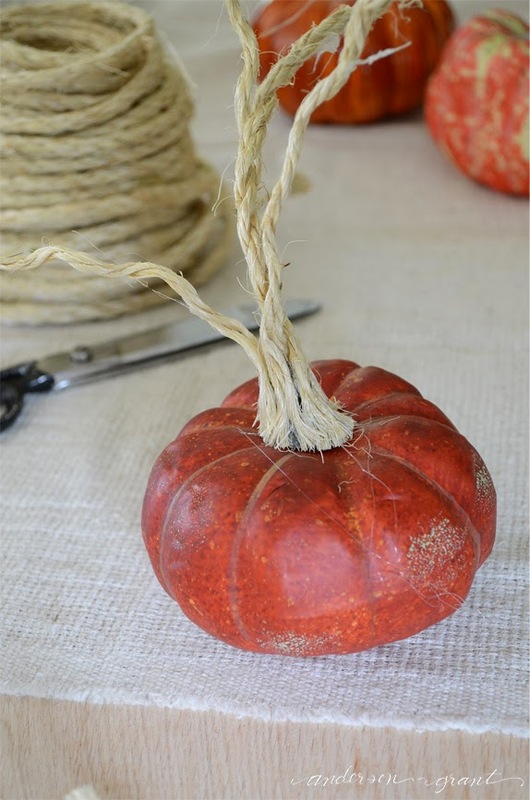 When it is dry, you may want to use some fine grit sand paper to rough up the stem a bit exposing some of the sisal. You may be happy with the look of your pumpkin now, but I still wanted to paint mine. I'm loving the color combination of mustard, golden brown, burnt orange, and sienna this fall. 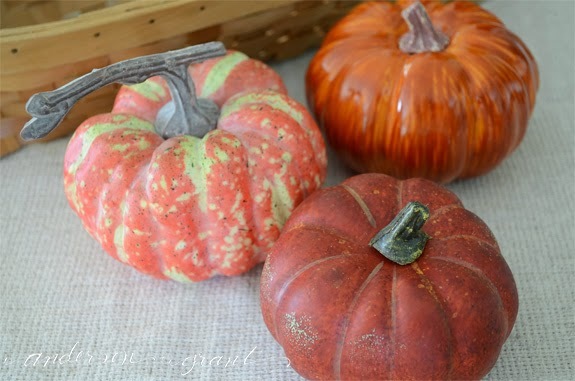 They are such warm, earthy colors and like most fall shades, look amazing together. 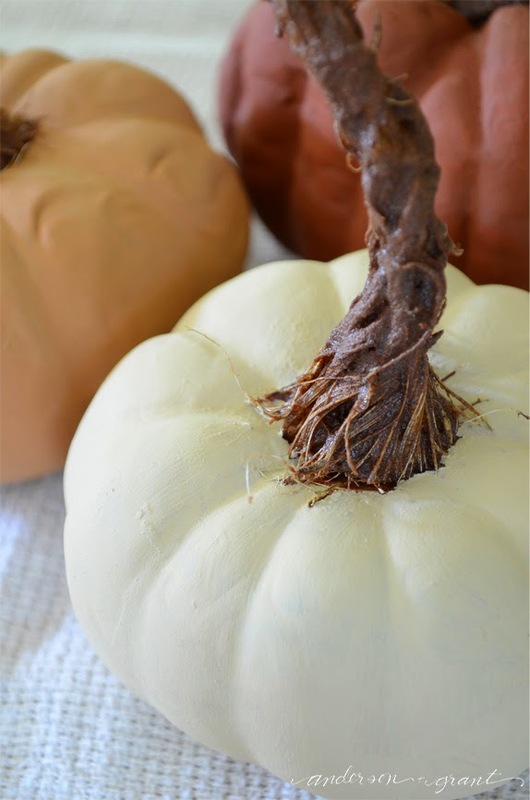 I decided that I would paint my pumpkins with chalk paint in these shades along with antique white. 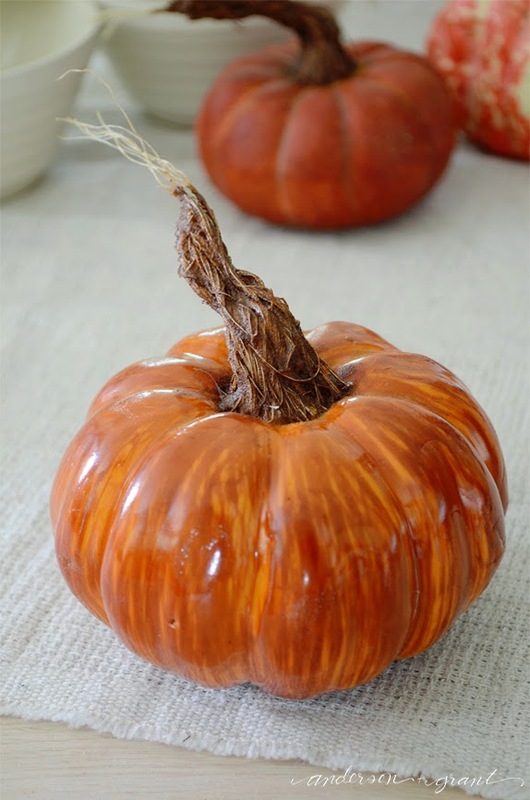 All of the pumpkins were coated with three coats of paint. So that I could paint the entire pumpkin at one time, I used a hair dryer to dry the bottoms of the pumpkins between coats. 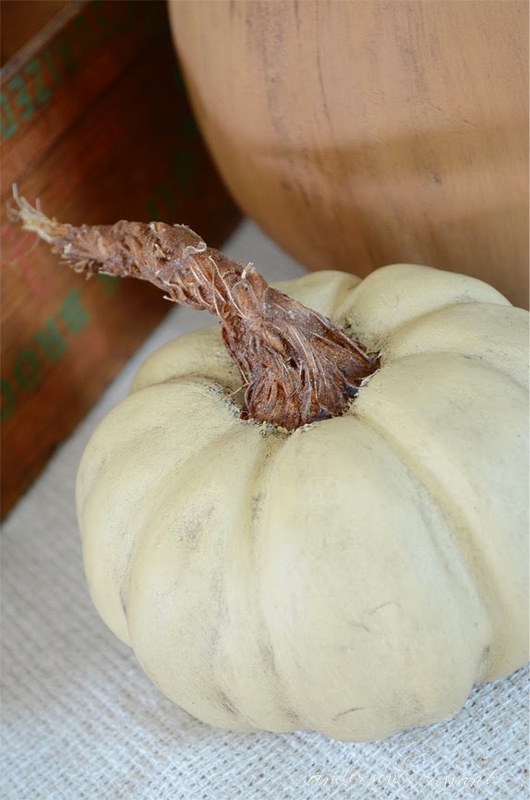 The dark wax settles into all the cracks and distressed areas you made when you started this project making the whole pumpkin look complete. I used a wax brush to put it on, but you can also use a rag. Then use a clean rag to wipe the excess wax off. I experimented to discover whether it is easier to do the stem or paint first. I did it both ways and found that it really doesn't matter which way you do it. If you do the stem first, you do have to be careful when painting that you don't get paint on the stem. But other than that, it doesn't seem to make a difference. 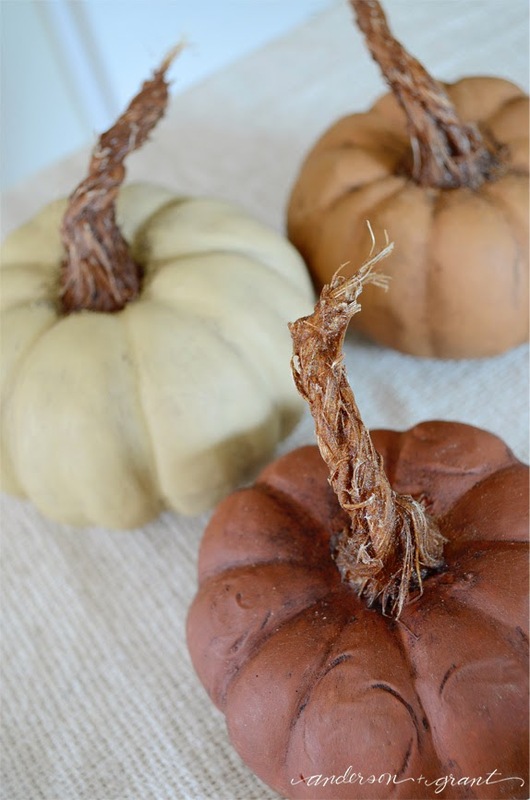 I am honestly in love with these pumpkins and I can't wait to decorate with them. 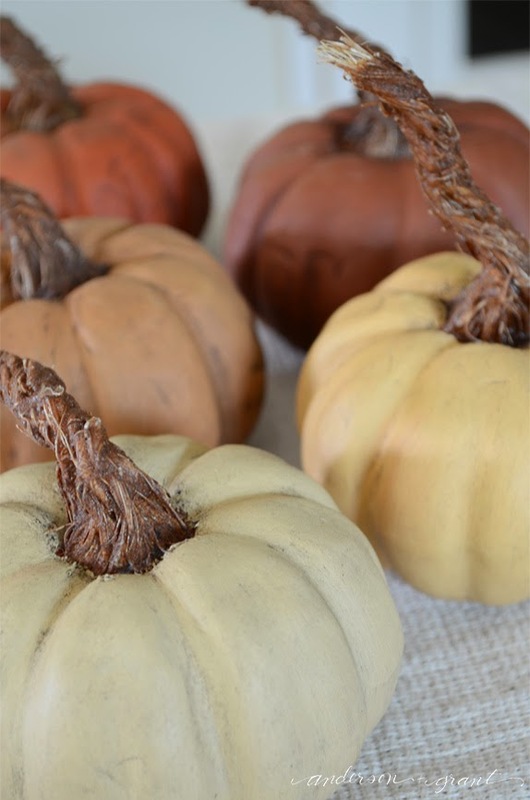 Whether they are mixed in an array of colors or just one hue, they look fabulous for fall.